Ten years after cigarettes were banished from all UK pubs, clubs, bars and restaurants, new figures from Cancer Research UK reveal there are 1.9 million fewer smokers in Britain compared to when the smoking ban was introduced in 2007, with smoking rates now the lowest ever recorded. Smokefree laws have had one of the biggest impacts on public health over the last decade. The drop in smokers means there are now around 8,300,000 adult smokers in Britain. Over this decade of clean air in pubs, the proportion of 16 to 24 year olds who smoke has fallen to 17% from 26% in 2007 – a record low. The drop in this age group is bigger than in any other. England was the last of the four UK nations to go smokefree, in July 2007. Scotland was first in March 2006, followed by Wales then Northern Ireland, both in April 2006. A new poll for Cancer Research UK of more than 4,300 people also revealed that very few people want to turn back the clock and allow smoking in enclosed public spaces. Only 12% were in favour of reversing the smokefree laws. Most people feel the smoking ban has been positive, with only 8% who think this change has made no difference to them or to public spaces. Almost six in 10 (57%) agree that the health of hospitality workers has improved, and almost four in 10 (38%) say their own health has also benefited from the reduced exposure to second hand smoke. Also 20% of smokers said the ban had helped them cut down the number of cigarettes they smoke, and 14% of ex-smokers credit the ban with helping them quit altogether. Almost four in 10 (38%) people across the UK believe that the ban has also helped protect the next generation from taking up smoking. 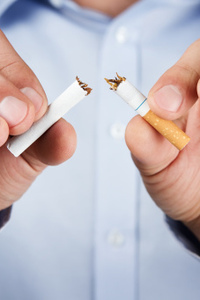 In addition to the smokefree laws, other measures have been introduced to help reduce smoking over the last ten years. This includes increased taxes, putting tobacco out of sight in shops, getting rid of cigarette vending machines and most recently plain, standardised tobacco packaging..
Cancer Research UK is calling on the government to publish a tobacco control plan without further delay, to help maintain the progress in reducing smoking rates. It says only by building on the success of the ban will the UK reach the goal of reducing smoking to 5% across all socioeconomic groups by 2035. Sir Harpal Kumar, Cancer Research UK’s chief executive, said: “We’re thrilled that 10 years on, the smoking ban has been such an enormous success. “Cancer Research UK worked incredibly hard for many years to ensure that the law would be effective and that no one would be exposed to toxic second-hand smoke. The impact on public health is huge. It’s rewarding to know that this effort will go on to have a great impact on the health of future generations.